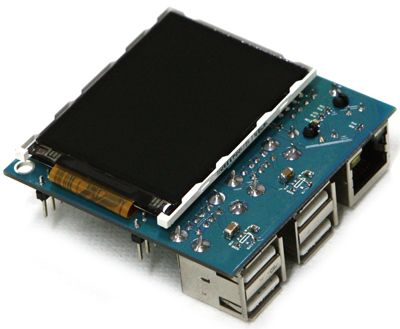 It uses the same SoC as the Pi, so is software compatible. It doesn’t include the ethernet/USB port chip, although you can connect one USB directly. Things that made me go “Oooooh”…. Real time clock ! Also, it has a LiPo socket so you can have your own mini UPS. (It actually makes reminds me of a http://www.digitalsmarties.net/products/jeenode-usb which has been down the gym too much. If you really want more USBs and Ethernet, there is a basic daughter-board which will piggyback for \$20. So that’s \$60 for a physically tiny Pi, with a screen, RTC, UPS… HouseMon you could fit into a surface mount wall box maybe? (Unfortunately the German distributor only has the standard board listed, so I’ve had to order from Korea to get the screen). I’m curious to see if I can hang an ATmega off of it, and put the “Pi” into a deep sleep/off, and have the ATmega wake it up once something interesting has happened. No touch interface, but hey, I’ve got history in rigging those up! Those are interesting boards, but I still prefer Banana Pro (gigabit Ethernet + SATA... the only drawback is that it can't be powered from the 40-pins connector).